There's a beautiful scene in this movie, the seventh movie in the Potter franchise, in which an old fairy tale is explained. The tale is of the Three Brothers, who encounter the deathly hallows and are each given a gift from Death. The scene is narrated by the father of one of the familiar characters, but for the first time in this series, it's illustrated as a two-color line animation. The animation is amazing, the story told is riveting. If this were the only scene in the entire movie, I'd be giving this film five stars. Unfortunately, the scene is preceded by about two hours of standard Hogwarty fluff (if you've sat through the first six films there's no need to explain what I mean by that). This movie, however, is decidedly different from those that have come before. 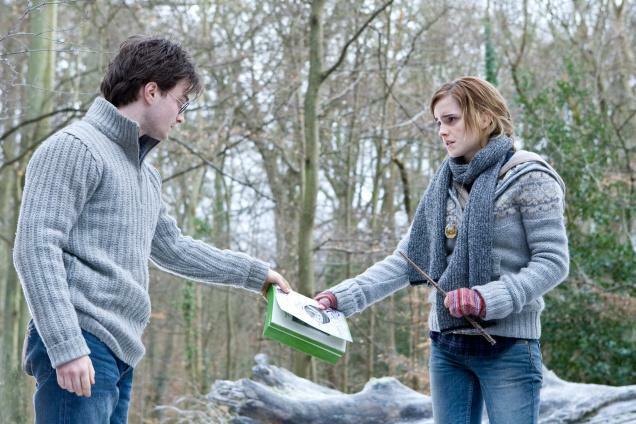 For one thing, it's slowed down - having decided to spread the last J.K.Rowling book into two separate films, the filmmakers are able this time to let us spend more time with the characters, and scenes are allowed to play out with some humor and intricacy. It's just too bad that these three young friends - Harry and his pals Hermione Granger and Ron Weasley - aren't more interesting. The actors often stand and react much longer than seems natural, as if operating their bodies via remote control. I couldn't tell if it was due to the stiff dialogue, or just their exhaustion at playing these same, unchanged, unevolved characters since they were ten years old. The other thing that's different is the absence of the school, Hogwarts. This time, the war with Voldemort is on full-force, and Harry and his friends are fugitives, whisking from one forest or glade to the next as they seek out the many horcruxes needed to destroy the evil lord (I'm surprised they weren't simply called mcguffins) and evade the death dealers who are after them. The film has a much more serious, adult tone (the actors are all grown up, for one thing, and the characters are all in mortal danger, for another), and war has come to the witches and warlocks of England. This war has decided tones of World War Two - with Nazi-like uniforms worn by Voldemort's minions when they take over the Ministry of Magic. There are also tones of Lord of the Rings (in the scenery and swords) and Voldemort reigns over his kingdom of ever-present evildoers, hunting down Potter like the Lord of Mordor. There are very blue and gray tones in this film, and I found that both a bit fascinating and after a while, annoying. I was distracted by blue/gray sweaters, cups of hot chocolate, blue/gray birch trees, November barren beaches while Potter and company flee from danger. How many scenes of still, quite forests symbolizing approaching war and death must we sit through? I can't believe there are actually seven horcruxes in this series and Potter has to go find and destroy them all. He had me with the second, and that was a few films ago. Even Potter's friends are tired of it, and Ron makes a big show of wanting to give up and go home. I was ready too, as perhaps stretching this story out into two films is a bit more than it can take. Once we get to the story of the Deathly Hallows and the death dealers finally catch up to the Potter gang, the story starts moving again. And then of course, just as it gets going, it stops: so you can wait for part two. They are certainly milking this series for all they can get. I'll admit, with its allegory of war and references to Nazi-style racial purity, this may be the best Potter film yet. And that animation of the Three Brothers is strikingly new and beautiful. But after seven of these outings, I just want this story to get to the end, already. And by the way, don't take my four stars as too definitive. It gets four because of that animated sequence. The rest of the film is decidedly three, at best.